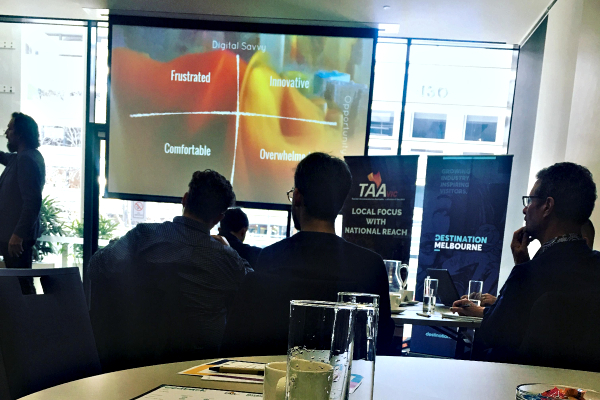 The other day I ran a transformative technology session as part of the Victorian Innovation Festival. During the session I asked the sixty or so participants who was currently involved of some type of digital transformation and about 50% raised their hands. From my experience this is about average these days, one in two organisations have some type of digital transformation agenda they are trying to pursue…and most of them will fail. 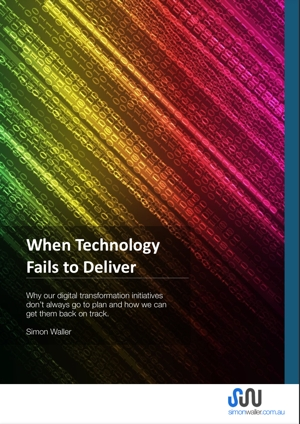 The exact rates of failure are hard to gauge, in fact the whole concept of digital transformation is rather murky (not least because there is no clear definition of what digital transformation is). But various research from ‘reputable’ organisations such as Bain & Co, McKinsey and HBR suggest that the chance of failure is somewhere north of 60%. This means you have a chance of beating your local casino playing blackjack than you do of running a successful digital transformation project. This is probably why there are so many articles and research reports on how to make your digital transformation succeed (or more often than not, how to stop them failing). Yet having trawled through a large number of these I’m consistently surprised that one key piece of advice is always missing. It’s the piece of advice that when I speak, train or coach clients always seems to create the biggest a-ha moment. And what is that piece of advice you ask? Do the right projects in the right order…and this generally means starting with the smallest things first. I think that this seems somewhat counterintuitive for many organisations (and consultants) when we have limited resources and we want to make impact fast then surely we should do the big projects first. The name making, game changing, future proofing type projects that will create the biggest bang. There are a couple of reasons for this. The first is that the complexity of big projects means that they often overrun on time and cost and underperform on outcomes. The second is that people struggle with big, irregular type changes. Most digital transformation efforts have only a little to do with technology and a lot to do with people. And changing people ultimately takes more effort, more care and more time than changing the technology. *Now I appreciate that some people might think this is politically incorrect but these are Owen’s words not mine…and Owen would put himself squarely in the fat camp. So the method I teach people when it comes to project prioritisation is called Rabbits and Rhinos. Just for a moment, imagine you were a hunter out wandering the African savannah. You spy a rhino off in the distance and think that if you could just capture and kill the rhino your tribe will eat well for the next month. But as you and your hunting party creep closer, you realise the rhino is armour plated, has a massive horn on the front and over a short distance can run faster than Usain Bolt. Now you could continue to pursue the rhino and perhaps things turn out well or perhaps they don’t…and the whole project turns out to be a dog. Alternatively you could start by pursuing the rabbits. Clearly rabbits are a lot smaller and there is a whole lot less to eat, but unlike rhinos there are hundreds if not thousands of them (by definition, they breed like rabbits) and they are far fewer risks in catching them. 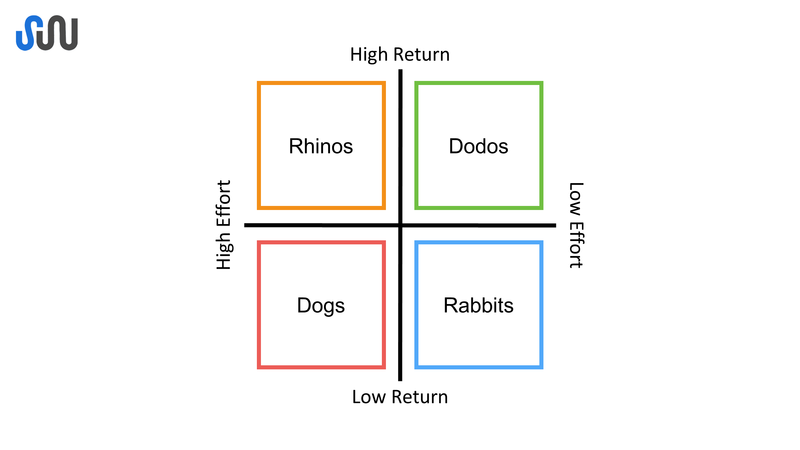 *Note: The high return, low effort projects are called the Dodos because they are so easy and so valuable we should have already done them all and they should already be extinct. There is often a tension people face when choosing the rabbits over the rhinos. 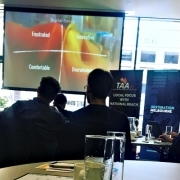 The tension is based in the feeling that we are so far behind and we need to catch up quickly (this is often a result of delaying the start of a digital transformation journey for too long). But desire alone doesn’t make change happen. Change ultimately happens because people want the change (there is a personal desire rather than just an organisational one) AND they also believe that they can (because the change is small enough to get their head around). So if your approach to digital transformation doesn’t make change easy for people, well, you’re best off packing your bags and heading to the casino. If you’d like to find out more about how you can drive incremental, bottom up improvements in your organisation through technology, head over to the Digital Champions Club.